Of course, that's assuming that the illustration below, published late last week on Monolith Soft's Facebook page in an attempt to attract designers, is a piece of concept art from the company's known-to-be-in-the-works 3DS title. Quite a few people think seem to think that's exactly what it is, though, and, well, that's enough for me at the moment. The reason some folks think that, by the way, is that the artist responsible for the illustration above is Yasuyuki Honne, who is a member of Monolith Soft's Kyoto-based team that has long been said to be working on a title for the 3DS. Curiously, someone calling himself (or herself) Instro shared the following illustration on NeoGAF yesterday. 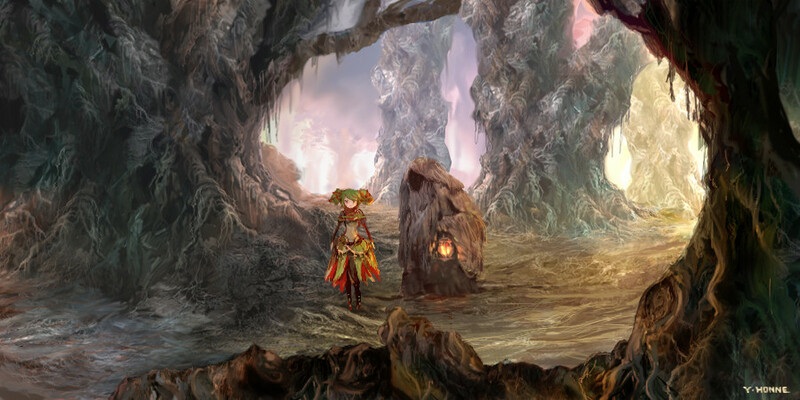 It's also the work of Honne and, as such, more than a few people believe it may be related to the image above--and to Monolith Soft's mysterious 3DS game, too. Although I hope both pieces have something to do with the company's latest portable offering (their last was Project X Zone), I'm especially enthralled by the first one thanks to its trippy, Wizard of Oz-esque overtones. How about you ladies and gents? Do you also like these illustrations and, if so, do you hope they're indicative of a forthcoming 3DS title? I will preorder this nameless game as soon as possible. I never played Xenoblade Chronicles but I saw a friend playing it once. Maybe I will give that one a try too someday. I'm certainly more inclined to pick this up than the Wii U title they're making. Well, let's just hope it actually is concept art for a 3DS or even Wii U game, Lizzi. If it is, though, I'm of course with you in wanting to pre-order it ASAP! As for Xenoblade Chronicles: you should play it sometime, if you're able. I've only put about 10 hours into it so far (or maybe just 7 or 8), but I really liked what I played of it. Really? I thought you rather liked Xenoblade, though--at least until the end. Was that enough to put you off of X altogether? That's too bad, if so. Regardless, though, you've got to love the kind of darkly whimsical nature of this art, don't you? I kinda forgot they were working on a 3DS game until this image popped up. Hopefully an RPG (which I'm sure it is). Hopefully it will come outside Japan too. And yea I can't wait to find out what X is going to be about. Will be great to have a big RPG experience on the Wii U. Yes, I'm also hoping for an RPG, Igor. Specifically, a turn-based one! Regardless, if the 3DS game Monolith Soft is working on uses this image as inspiration, I'm sure it'll be worth owning. Also, yes, X is going to be great, I think. How can it not be with that awesome trailer? I wouldn't say that, Igor. After all, Xenoblade isn't/wasn't turn-based--or at least it isn't in my opinion. Sorry you have to deal with a delay for Fire Emblem. Looks like I'll be waiting a bit for my copy, too, although it should arrive sometime this month. Xenoblade was almost ATB-like in a way ;) I don't mind that too much as there is a delay, giving you some time to think what to do next. I just can't stand 100% real time (like Tales games). Oh, I agree that what was in Xenoblade was better than a fully real-time RPG, but I'd still prefer Monolith Soft's next game(s) to be a bit more traditional in terms of battles.